A little over a week ago, I picked up the Deathwatch core rulebook. I had been thinking about getting it for a while and finally got around to buying it. Deathwatch is one of the Warhammer 40,000 role-playing games, and in it players take the role of space marines defending the Imperium of Man from alien threats and the ever present danger of chaos. While I haven’t finished reading the rules, what I have read so far convinced me to dig my old miniatures out of the boxes that they’ve been in for the past 8 years. 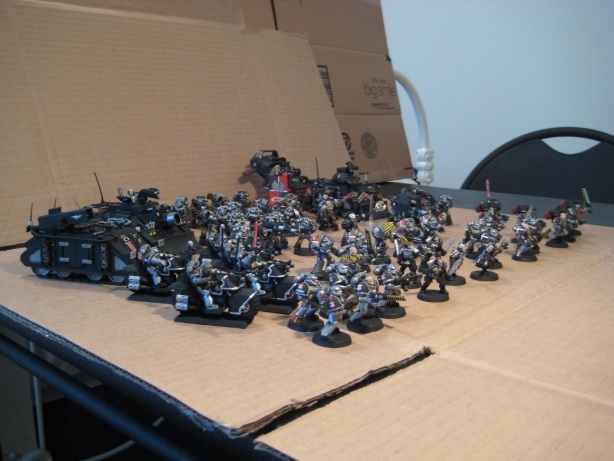 My first introduction to Warhammer was when a friend and I happened to wander into a Games Workshop store at a local mall. We played a demo and I ended up walking out of the store with a starter box with small forces of space marines and dark eldar. Within a couple years, I had a 4 × 8 table set up in the basement and most of my Boy Scout troop was playing. In addition to my space marine and dark eldar army, other scouts had tyranids, eldar, chaos space marines, and a second dark eldar army. A couple years after that when I headed off to college, my miniatures got packed up and were left that way until now. Over the weekend, I unpacked my space marines and dark eldar and managed to repair most of the ones that had been damaged while packed and moved across the country (one devastator marine is still missing an arm). I even managed to convince my wife to play a quick battle against me which showed how rusty rules knowledge gets after almost a decade of not playing. It was still fun though, and I’m looking forward to getting back into painting and playing. 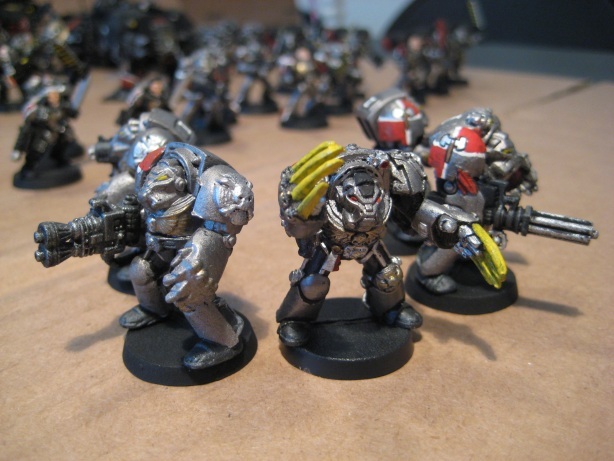 My space marine army is the larger of the two and I painted them metal and black with a few red and white highlights. Looking at my army, its clear that I had a strong preference for lascannons when I was playing since I have 8 of them scattered throughout the army. I think that’s probably attributable to some early frustrations dealing with the monstrous creatures of my brother’s tyranid army. 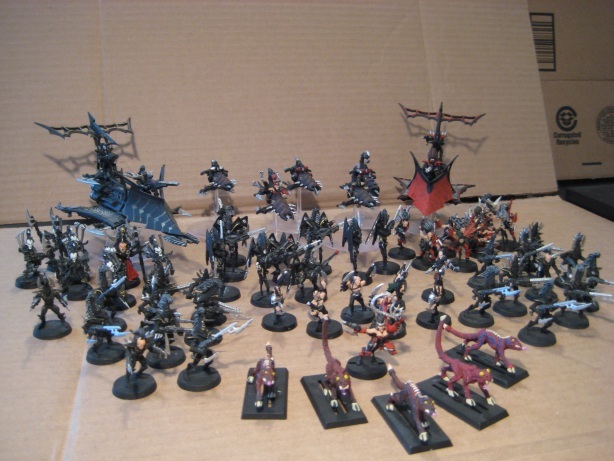 The dark eldar army that I have is worth about half as many points as the space marine army. I think they were originally painted green and red, but I then re-painted them with a black color scheme (I apparently was into black while playing). My favorite units in this army are the reaver jetbikes and the incubi retinue of the army’s commander. 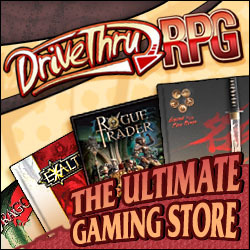 I think I’ve figured out where the money that gets freed up by the light D&D product schedule this year will end up going. What did your wife think of WH40K? 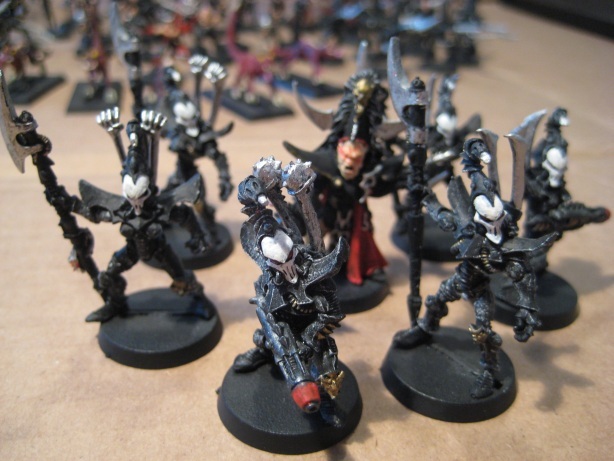 Did the WH minis thoroughly distract you from Deathwatch? My wife’s played the D&D miniatures skirmish game with me before, and enjoyed it, so 40k wasn’t her introduction to wargames. During our game, she played the dark eldar and did pretty well. That said, she wasn’t a huge fan of the 40k miniatures that I have. She’s generally more interested in fantasy than sci-fi, so Warhammer Fantasy would probably be more her thing. I don’t have any immediate plans to run or play Deathwatch, but I’d still like to get around to it at some point. Maybe after I finish up the Dragon Age adventure I’ll be starting this weekend. The hobbying aspects of Warhammer are much easier to fit into my schedule because I don’t need to coordinate with anyone else to paint. Once I get caught up on the new edition, I’ll see how much time I can squeeze in for playing at local stores and how that affects the rest of my gaming schedule. I know of a ragtag battle squad of Catachan Jungle Fighters with a few pieces of heavy armor and more than a little bit of fight left in em. There all there except Crazy Charlie, who had his head popped off by Owen of the Brady Clan. Game On!